Get a professional image with your targeted marketing in a cost effective way using the Saturn 40. Matt finish, premium quality aluminium enhances the look of your graphics. 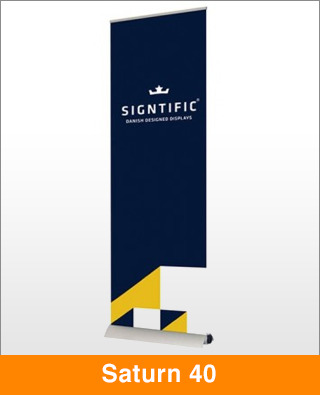 Interchangeable cartridges and magnetic leaders saves time and makes it easy to change banners. Patented hinged design gives the extra deep base unrivalled stability when extended to 2.4 meters high.